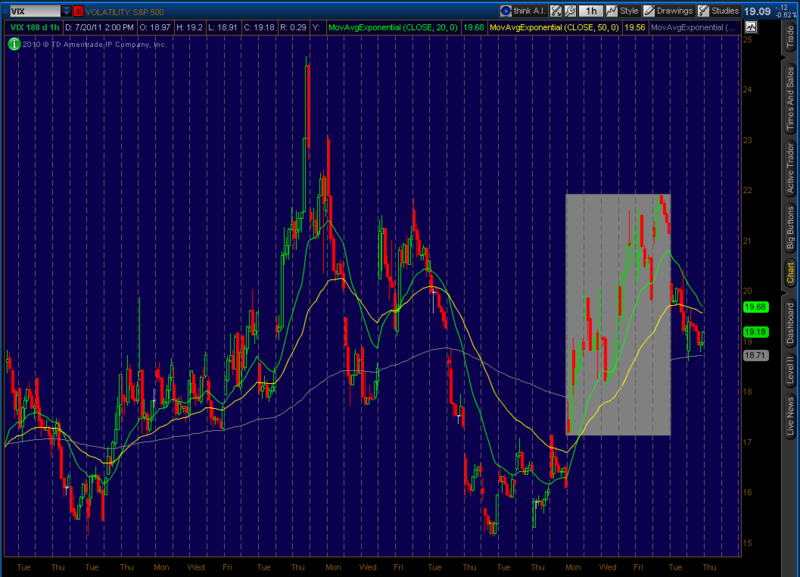 The regression area of 7/11/11 – 7/18/11 correlates to a spike in the VIX. Since June 8, I’ve been publishing article after article arguing for why the market was likely to undergo a substantial decline at some point during the summer. My reasoning for arguing that the conditions favored a Summer Crash? First, the overwhelming bearishness that existed toward bonds. Second, the fact that the bond/stock price ratio had been trending higher since mid-February. Third, intermarket relationships, particularly relating to junk debt spreads, were reaching extremes. And then came last week, the market’s biggest weekly move in 2 years. To put the week into context, the enormous comeback in risk assets in 5 days at quarter end ranks as being in the top 2.5% of all weekly gains for the market since 1950. Perhaps more stunning was the complete collapse in bonds and substantial increase in yields in government debt. Incredibly bright traders and bond managers have been commenting as of late that the move was breathtaking back into risky debt, and that it was nearly impossible for anyone to make money as a result because of the speed of the price action. Markets have a funny way of doing the unexpected. For me, the move was particularly frustrating since I had just written a piece arguing for further declines for Mr. Marc Faber, who was kind enough to publish it alongside his Monthly Market Commentary just last Thursday. Was I completely wrong, or is this another head-fake that can still result in a Summer Crash? Let’s take a look at the price ratio of Bonds to Stocks to see what really happened last week. As a reminder, a rising price ratio means the numerator/TLT is outperforming (up more/down less) the denominator/IVV. The blue line is a rolling 20 day (1 trading month) moving average. The relationship of bonds to stocks completely collapsed last week. In my series of articles arguing for a Summer Crash, I made the argument that the TLT/IVV price ratio should actually be closer to 1 given the stunningly low yields we saw just prior to last week’s move, and given the magnitude of outperformance in defensive sectors such as Consumer Staples (XLP), Healthcare (XLV), and Utilities (XLU) for the bulk of the year. One week gave back six week of bond outperformance relative to stocks, sending the price ratio to mid-May levels. Are the conditions for a Crash now erased because of a single week that ranks in the top 2.5% of all weeks going back to 1950 for equities? Does the move even make sense given that there were weekly fund outflows out of equities last week? Sure, one could argue that Greece is resolved for now, but what about Portugal? Spain? Ireland? Forget about country sovereign risk – what about junk debt? Equities tend to go through periods of hightened volatility when junk debt falls/yield rises, coinciding with an opposite move in Treasuries. When credit spreads widen, it’s a big warning sign. Take a look below at the price ratio of the SPDR Lehman High Yield Bond ETF (JNK) relative to the 7-10 Year Treasury Bond ETF (IEF). When the ratio rises, it means credit spreads are compressing. When the ratio declines, it means credit spreads are widening. When credit spreads widen by a substantial amount (as they did minutes before the May 6 Flash Crash happened), watch out. Yes – there was a massive comeback in junk debt last week, which ultimately is what caused equities to recover as violently as they did. However, the move is too extreme. The JNK/IEF ratio has not gone back to new highs. If anything, the ratio appears to be headed back down again. In conclusion? There was a reverse crash that happened last week, but these ratio relationships still need to be resolved. Given still historically low yields and still elevated outperformance in defensive sectors, I continue to believe the price ratio should be closer to 1, not 0.703 as it is now. What would confirm this is if Junk debt relative to Treasuries collapse once again and give back all of the outperformance gained last week. Time will tell of course. The only thing I know for sure is that markets fluctuate. With market volume below abysmal levels, and with market breadth at the highest in what appears ever, many are wondering how it is possible that the S&P could move by about 70 points in one week. Simple. As the chart below shows, NYSE short interest for the week ended June 15 was the highest in 2011, at 13.5 billion shares, a jump of 333 million share in two weeks, which certainly persisted into the second half of the month, just in time for the market to realize that with QE2 ending, and nobody left to buy bonds, rates have nowhere to go but up. The net result is one of the most epic short squeezes in recent history, coupled with one of the most rapid moves out of bonds and into equities, and if judging by the 5 Year bond, the most rapid ever. What the message from all of this is, aside from the fact that higher interest rates are supposed to somehow be better for the economy, is that the entire market now has adopted a HFT modus operandi, where nobody even bothers to discount, and all the action is reactive. We are not sure about readers, but the fact that the market has lost its most fundamental feature – discounting – is just a little troublesome, if not surprising. Such is life under centrally planned capital markets. I’m not going to even begin to try and make sense out of today’s market. Watching fires burn and teargas fired in Greece, 100 pip moves in the EUR/USD in minutes and computer algos tripping over each other was surreal beyond words. This market right now is a lottery. Calling equities forward looking or a pricing mechanism is beyond ridiculous. It is during noisy times like these that investors must step back and keep things in perspective. Trading on days like today requires little skill and a lot of luck. When I step back I see a deteriorating economy and an equity market trying to understand what to do. Do they “price in” a soft patch or a full blow recession. Market participants are told it is in fact a soft patch. The slightest hint of positive data reinforces those views. Using history as an example I want to share with you the 2007 “soft patch” and how equity markets priced in that economic headwind as well. Below are a few notable quotes discussing the soft patch which in fact was a recession that began in December 2007 with Q1 2008 the first full quarter of contraction at minus 0.7% from the plus 2.9% in Q4 2007 (my how fast things can change). 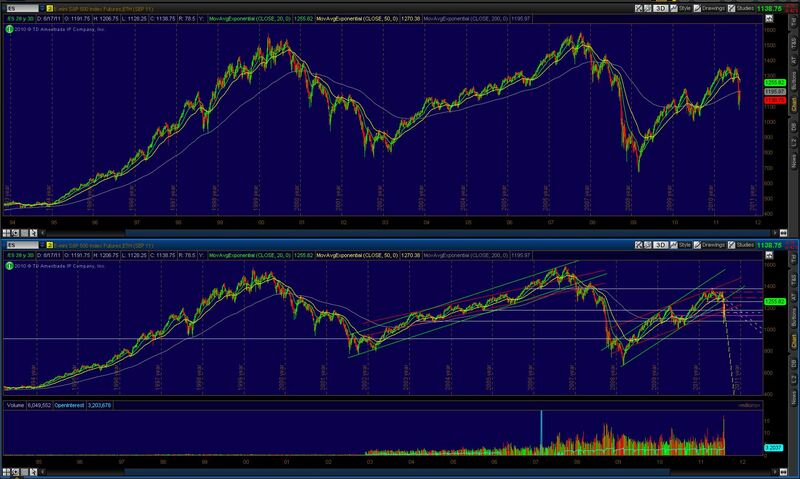 The following side by side comparison of the current SPX and that of December 2007 is messy but “bear” with me as the similarities are rather interesting. This is not an Elliott Wave analysis either. Notice the relationship among Point A, B, C, D and E on both charts. The two highs of the topping pattern are Point A and C with C being slightly above A (imagine those technicians declaring a breakout). The two lows of the corrections are Point B and D with D being slightly above B (imagine those technicians saying we put in a higher low thus bullish for price). Point E is the question in terms of where we are now. Using the current trend lines off the 1,370 high SPX 1,320 would be the modern day Point E.
Equity markets struggled in 2007 to price in the recession efficiently and were only two months forward looking. In this highly leveraged, exuberant and low cash market why are we to think 2011 is any different? The “Greek austerity measures” i.e. Greece’s second bailout in 1 year is scheduled to pass Wednesday and the market is buying going into the vote. May 6 – queue flash crash. DJIA drops 1,000 points before recovering hitting intraday lows of 9870. SPX drops 100 points hitting lows of 1065. May 9 – Europe approves a trillion dollar rescue package creating the European Financial Stability Facility and Greece gets a €110 billion loan. The second Greek bailout which will be passed tomorrow is going to be over €120 billion. If you feel like being a philanthropist I hear the yield in Greek bonds is more than 30%. US markets have been pricing in the vote over the last two days giving investors short term profits and an illusion of market strength. Come Thursday the money will remember that the end of the month marks the end of QE2 and the dollar will continue its deflationary uptrend forcing equity to feel the pain of lower prices from a stronger dollar. 10-Year notes saw a significant nominal drop from this activity. Food prices (corn, wheat, sugar) are rising to their highs of last week and will drop back down to their lows after the news has disseminated through the market. The /ES bounced off the highs from 6/7/11 and is selling off slightly in the after hours session but relatively holding its closing price. The current activity is a repeat of the FOMC decision last Wednesday when overly exuberant investors hoped for another round of stimulus to prop up the market. Even though during the days leading into the announcement it was made clear to the public there would be no 3rd round of QE there was still wild speculative buying on 6/20 and 6/21 which led to an identical move down over the following two days starting at 11:25am (10 minutes after the Bernanke aka Bertanke started speaking). I have to say the balance here is quite impressive wrt the time and magnitude of the move up being essentially identical to the time and magnitude of the move down with the Wed FOMC coming right in the middle. 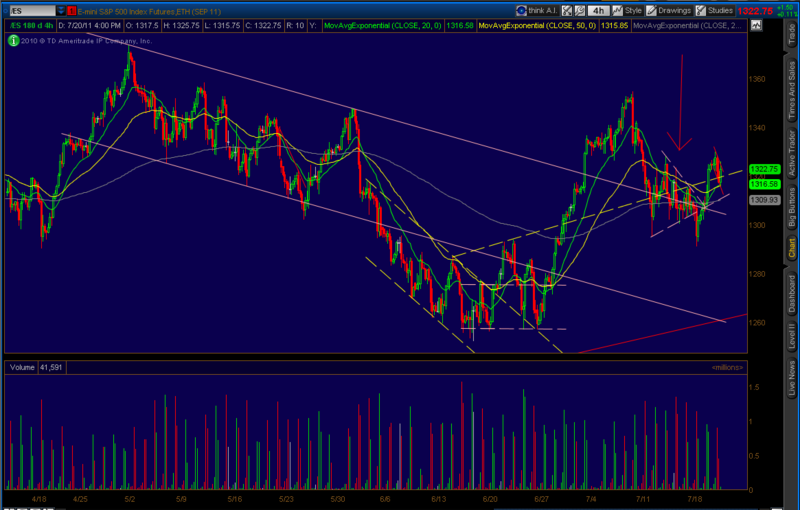 I’m looking forward to watching this all play out and have nothing but love for volatile markets. This is the time when all the tweets and blogs start about hitting the links, or grabbing drinks early, or heading for the beach. If you have ever traded prop at a big firm you will see seats empty on Friday after 1pm. There will be many who do not come back from lunch on a Thursday. Missed Mondays and long weekends are a given. I just do not get this. When I first started trading we considered it a privilege to be connected to the inside market. Well it is. It was not that long ago when the banks had a monopoly on connectedness to the inside market. Never forget that. Trading is a privilege. In this world of over-stimulation and immediate feedback do young traders expect too much action all-the-time from the market? If you have to sit and just watch stocks trade from 11am to the close without a trade is that so horrible? You are not laying concrete on an overheated highway. You are sitting in a comfortable chair, A/C blasting, surrounded by friends, with access to the internet and music and TV. Part of trading is waiting, just being on your desk, ready to pounce on an unexpected opportunity. If you do not have a vacation planned then sit in your seat and focus. Trading does not mean always having positions. A great deal of trading is gathering data so that you can gain an edge for a future trade. That might be intraday, or the next session or next week. But if you not at your seat because you deemed a session too uninteresting for your full focus then you are not preparing yourself for that next great trading opportunity. This is not you at your best as a trader. Once you accept that you can conclude a day not worth your full attention you become a lesser trader. If you step onto a trading floor you are there to work. All day. With all your focus. Anything less is unprofessional.